The Seattle City Council Monday approved legislation that will double the amount of shared bicycles on city streets to 20,000 and approved an 18-month timetable for creating “a connected, protected bicycle lane network” downtown that will include a Pike/Pine route to connect with Broadway. “Ensuring that we are making our public right-of-way safe for pedestrians, for cyclists, and prioritizing transit, is an issue of environmental justice, economic justice, racial justice, and gender justice!,” Council member Teresa Mosqueda ‏said about the vote Monday for the resolution to put a timetable behind the downtown bike plan. Advocates have been pushing City Hall to put more effort behind the network concept based around a 2nd Avenue “spine” connected to bike lanes from surrounding Central Seattle neighborhoods. CHS reported earlier this month on the Pike/Pine component of the plan that advocates are hoping to have in place starting in 2019 with $10 million in funding from the public benefits package attached to the expansion of the Washington State Convention Center. The newly passed resolution will require SDOT to make quarterly reports to the council on progress in creating the new protected bike lanes. In a second vote Monday, the council also approved a plan that will help keep those new lanes busy. Monday’s expansion of Seattle’s floating bike share program will open the way for a doubling of the fleet to 20,000 bikes and allow up to four providers to operate in the city. The expansion comes with new rules including a requirement for SDOT to document parking requirements the providers must follow. The expansion also includes a big jump in fees the providers must pay to $250,000 per permit. Following the vote, one Seattle provider already on the way to shutting down its operations in the city said the fee would be the final straw while another said it was eager to be part of the expansion. 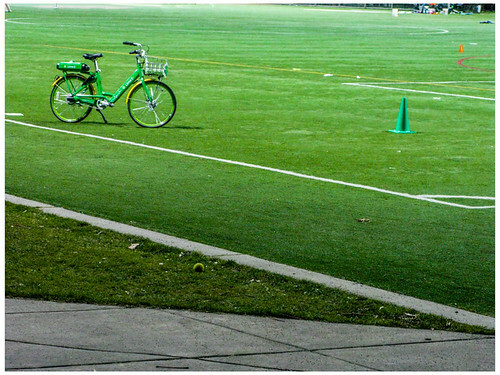 So, goodbye, yellow bikes and it looks like the green bikes are here to stay. This entry was posted in News, etc. and tagged bikes, city hall by jseattle. Bookmark the permalink. There is an existing bike lane on 2nd Avenue, so this makes the proposed lane on 4th Avenue redundant, and a waste of taxpayer dollars. If a cyclist’s destination is on, say, 4th or 5th Avenue, is it too much to ask they he/she walk their bike up from 2nd Avenue? Aren’t cyclists supposed to be fit? People on bikes aren’t “supposed” to be anything other than people trying to get to and from shopping and work. 2nd to 4th is a very steep grade, and if your bike is loaded down with work equipment and/or groceries, getting up that hill can be very hard. Also, people going north on 2nd ave face traffic lights timed in the opposite direction, so you have to stop pretty much every block. It’s very slow. 4th ave flows northbound, and the traffic lights are timed accordingly. If your destination is, say, on 6th ave, to walking up four steep blocks with a bike becomes a big disincentive, even more so than if we asked someone in a car to do the same. I think it’s entirely appropriate that the city prioritize safety for space- and energy-efficient ways of getting around town. And that means making it safe and reasonably convenient. The street grade between 2nd & 4th is steep only south of Union and west of 4th. So, a bike lane on 4th would only benefit a relatively small number of cyclists (those whose destination is within that area). Also, if your comment about the traffic lights on 2nd is accurate, wouldn’t the same problem occur for those cyclists traveling south in a 4th Ave bike lane? I don’t know what to tell you, Bob. I don’t think it’s unreasonable that one out of every three avenues downtown would have a facility for safe biking, especially with the energy it takes to climb hills. Cycling is far more space and energy-efficient than car travel. Existing bike lanes (westlake, fremont, 2nd ave) transport thousands of people on bikes each day. And time after time, research shows that safety is the #1 reason more people don’t ride bikes (or use scooters, etc). On a per-trip basis, safe bike facilities are far less expensive **for taxpayers** than most other ways of getting around. And we benefit through less congestion and pollution. Please explain exactly why you think it’s a waste of taxpayer money. I don’t get it. There is an existing car lane on 2nd Avenue, so the existing lanes on 4th Avenue are redundant. Motorists can just find a parking garage to store their automobile off 2nd Avenue and walk themselves up to 4th or 5th Avenue if that’s where their destination is.